Bengaluru: Medical Practitioners associated with government hospitals in the state would not be allowed to channel prescriptions to private pharmacies, as the Karnataka Health Department has issued a stern circular to public hospitals in this regard. The circular clearly states that government doctors cannot prescribe medicines that are only available at private pharmacies. The circular further calls for strict adherence. Those who fail to comply with the said order may not only see their salary being withheld but also face disciplinary action, which can even go the extent of dismissal from service. Moreover, the Karnataka Health Department has also directed the doctors (both permanent and contractual) to submit self-attested affidavits to the department stating that they will not write prescriptions for medicines to be bought from private pharmacies or indulge in any other malpractices (such as referring the patient to a particular pharmacy) from now on. Following the Health Department’s order, the Chief Officers of hospitals and District Health Officers have been directed to handover the salary to doctors only after the submission of their affidavits. The decision came after the Health Minister K.R. Ramesh Kumar, during a recent visited to Koratagere Taluk and found that patients here were regularly being asked to buy medicines from outside, due to the empty stocks of medicines at government pharmacies. 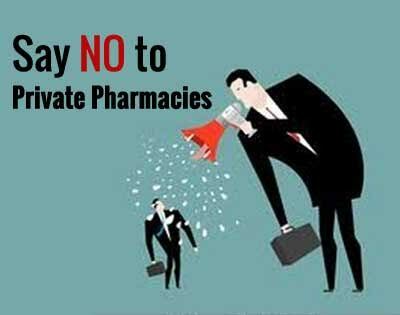 Many medical practitioners have shown opposition to the move, on simple grounds that medicines are not adequately available at Government Pharmacies. Describing the decision of health department is ‘incomprehensible‘ as, doctors pointed out that Government pharmacies have not adequate stocks of medicines and also that the ARS funds, that are available only in district and taluk hospitals, are not adequate for drug procurement. This is a big joke. Every govt doc knows that when writing a prescription, the pharmacy will not have all the drugs in the prescription. Eg DMARDS for RA, anti epileptics etc and when the patient presents the list the pharmacist will say that certain drugs are not available and ask them to come next week knowing fully well that the story will be the same. The poor fellow will keep on trying for a few weeks and then will stop coming and will get worse without treatment. So us better that tells patient die than be directed to buy outside. Isn\’t it? I think all health care of the netas and govt officials must be made compulsory in GH then the the situation will improve. Something seriously wrong with healthcare managers in Karnataka.